Bechstein Pianos are renowned for their unique sound. The pianos are painstakingly constructed using high-end materials and for over 150 years now the name Bechstein is associated with quality. That’s why we are proud to have Bechstein Pianos for sale. C. Bechstein Pianoforte AG (also known as Bechstein, is a German manufacturer of pianos, established in 1853. The company’s founder, Carl Bechstein studied and worked in France and England as a piano craftsman, before setting up his own piano making business. Like most great artisans his first creations were made for other companies, but he dreamed of having his own business. Bechstein founded his own piano factory on 1 October 1853 in Berlin. He set out to create a piano that was robust enough to able to withstand the great demands imposed on the instrument by the virtuosi piano players of the era, such as Franz Liszt. So right from the early days these instruments were closely associated with the top performers of the day. Any self respecting pianist wanted to emulate their heroes, and so a Bechstein became a status symbol. By 1870, with endorsements from Franz Liszt and Hans von Bülow, Bechstein pianos had become the must-have piano in many concert halls and private mansions. In just 17 years, Bechstein had positioned them selves as industry leaders across the world along with other piano makers, Blüthner and Steinway & Sons. Bechstein has been known as a maker of bespoke artcase pianos since the 19th century. Artcase pianos tended to be commissioned by interior designers for royal palaces and stately homes. Bechstein hired artists and craftsmen to produce special pianos, lavishly decorated with gold, hand-carved details, and hand-painted art on the piano case. Today, some of the artcase Bechsteins are now museum pieces, whilst others trade well at musical-instrument auctions, mainly in London and New York. Bechstein pianos are also popular with more contemporary composers and musicians too. Bob Dylan is mentioned on many Bechstein dealers’ web pages as a regular Bechstein player. Dave Stewart of The Eurythmics, The Beatles, David Bowie, Elton John, Lou Reed, Carly Simon and Supertramp all recorded music using the Bechstein concert grand at London’s Trident Studios. That particular piano is over a century old and much sought-after for its sound. It became one of the most frequently recorded instruments in rock history. It was used in the studio from 1968 until the mid-1980s, and has since been sold at auction. The late, great Freddie Mercury, of the British rock band, Queen, played a Bechstein piano on the best-selling album A Night at the Opera. The music video for Elton John’s “Sorry Seems to Be the Hardest Word” features John playing a white Bechstein grand. But why are they so popular? This video gives some insight. Given that Bechstein pianos are still so popular with performers today, it’s little wonder that the pianos, whether grand or upright are still highly sought after instruments. If you’re an admirer of these fantastic instruments, then you’ll be pleased to know that as well as offering a wide range of piano brands for rental, Courtney Pianos, Oxford also have a number of Bechstein Pianos for sale. So you too can have the chance to own the unique sound of Bechstein. Upon receiving an enquiry for restoration we will find a suitable time to view your piano either at your home or if that isn’t possible, we arrange for the piano to be collected and then inspected at the Courtney Pianos workshop in Oxford. It is sometimes possible to make a remote assessment of the work required. If you have access to a digital camera, please photograph the broken or damaged area of your piano and email us the photos. Provided that we can see enough detail, we will report back to you with our initial thoughts. Once the piano inspection has been carried out a conversation will take place in which we will ask you what areas are most important to you as the owner of the piano. Some people ask for a full internal restoration only. This means that the piano will play superbly but the cabinet is left in an unrestored condition. Most people, however, choose to have a combination of internal and external work on their instruments, after all, they do tend to stand out within most people’s homes. When you have given us the instructions about the areas of work to be carried out we will produce a detailed quote. Ninety-Nine times out of 100 our piano restoration quotes will give you the full and final price. Occasionally there will be some internal and unseen issue happening in the piano that is impossible to see on the initial inspection. If this happens it will be explained and discussed in total transparency. These ‘hidden’ problems are rare but if they do occur we will do our best to keep any additional costs to a minimum. We will not proceed without your consent. After you decide to go ahead with the piano restoration, we will collect your piano and it will come to our workshop in Oxford where the refurbishment and restoration work will be carried out. We do not send your piano abroad to be worked on, unlike some other companies who prioritise their profits over the quality of the craftsmanship. We prefer to keep everything in house because we believe in overseeing all the work carried out in our name. How Do You Fix Pianos? 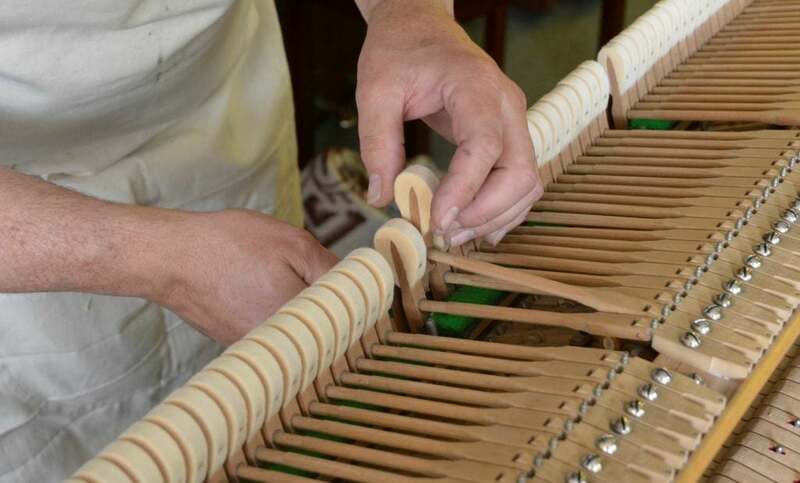 During our Piano restoration process, your piano will move through our workshop where one team will work on the soundboard, frame, repining, restringing etc. Next, it will then move to the polishing department to apply the finish you desire and at the same time, the action will be completed. The piano is then re-assembled, regulated and tuned, and will receive its final checks, before being returned to the destination agreed. Along the way, if possible, we encourage you to come in and see the stages of restoration and watch your piano be transformed. Our costs are fully transparent but they do vary based on your piano. The piano size, piano design and the condition of the piano are factors that will change the price.